Stock # 3095, 3.0L L4 16V DOHC 16V, 6-Speed Manual, 92572 mi. 1 OF 414 EVER PRODUCED!! EXCELLENT SPECIMEN!! NEW TIMING AND BELT SERVICES!! 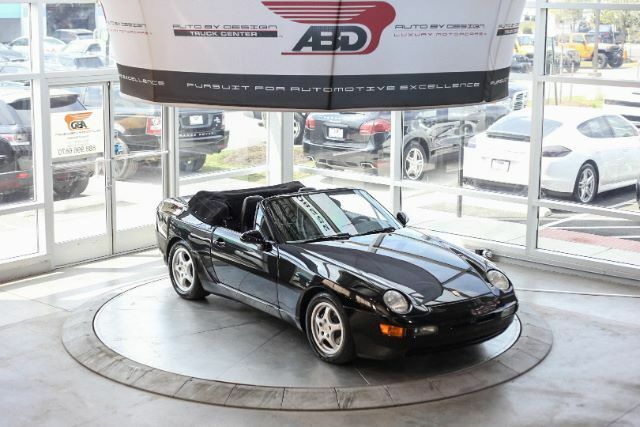 This 1993 Porsche 968 Cabriolet is featured in Stunning Black with Black Soft Top and Premium Black Leather. Powered by a 3.0L L4 16V Engine mated to a 6 Speed Manual Transmission. Very fun and responsive to drive! This is from the Personal Collection of the Owner of Auto By Design. This 968 comes fully optioned with Premium Leather, NEW Premium Blaupunkt Audio System, Ice Cold A/C, Convertible Top, Power Windows, Power Locks, Power Seats, Pop Up Headlights with Visible Lenses, 17 inch Factory Wheels wrapped in All Season Michelin Performance Tires! This 968 is for the Porsche Enthusiast and is quickly becoming a Collectible item! This Porsche 968 comes with Factory Books, Mats and Key. ****** All of our high-end vehicles are processed through a Multi-Point Inspection to ensure that the vehicle is of the Highest Quality & Drivability, please inquire about our vehicles and ask a representative for more information. ****** This 1993 Porsche 968 Cabriolet comes with a Clean Carfax Report. We offer Nationwide Shipping right to our door step and we offer Worldwide Shipping logistics as well as Financing is also available for our vehicles with rates as low as 3.79%** for well qualified buyers**. Auto loans are our specialty. We are experts in helping individuals with good and bad credit obtain a car loan for the purchase of a new or used vehicle. All of our new and used car loan services are hassle-free and there is no obligation for you to apply for a car loan today. We can help you finance your next car, truck, van, or sport utility today with our easy auto loan application.